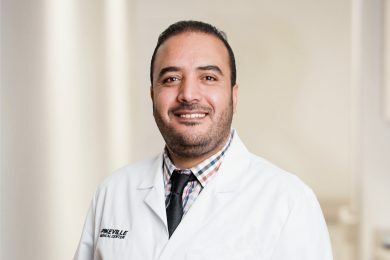 Dedicated to the prevention and treatment of pulmonary disease, Pikeville Medical Center’s (PMC) board certified pulmonologists provide comprehensive care for patients with or at risk for lung disease. 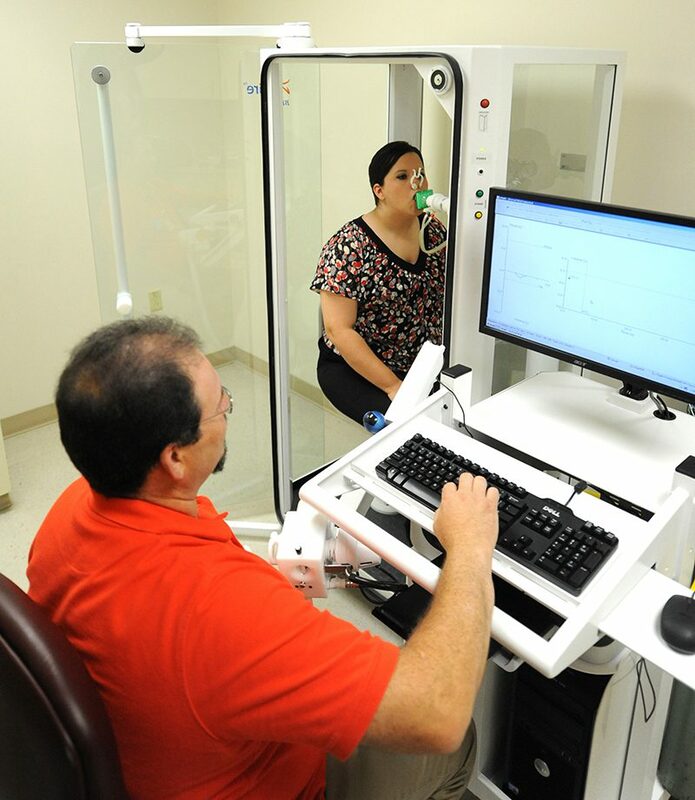 PMC’s pulmonary clinic offers the latest advancements in lung care with procedures such as endobronchial ultrasound (EBUS), pulmonary function testing (PFT) and electromagnetic navigation bronchoscopy (ENB). PMC also provides patients with pulmonary rehabilitation, an exercise and educational program for individuals who have any chronic pulmonary disease that causes shortness of breath and a reduction in the ability to perform daily activities. The program offers substantial benefits in improving lung function, reducing symptoms and improving quality of life for persons with chronic lung conditions. Pulmonary rehab classes meet two to three days a week for six to ten weeks and last approximately 60-90 minutes. 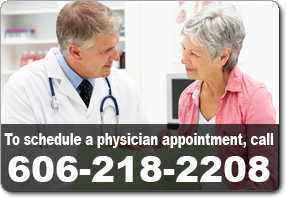 Board Certified by the American Board of Internal Medicine. Specializing in Pulmonary Diseases, Shortness of Breath, COPD, Lung Nodules, Pulmonary Function Testing, Bronchoscopy, Lung Cancer and Black Lung. Member of the American College of Physicians, American Thoracic Society and the American College of Chest Physicians. Specializing in Pulmonary Diseases, Shortness of Breath, COPD, Lung Nodules, Pulmonary Function Testing, Bronchoscopy, Lung Cancer and Black Lung. Pikeville Medical Center’s (PMC) Pulmonary Clinic now offers patients superDimension iLogic Electromagnetic Navigation Bronchoscopy (ENB). This new system is used to easily diagnose and plan the best treatment for lesions (spots or abnormal growths) found in the lung. Performing ENB procedures since July, PMC is the only hospital in the region to provide this technology. ENB uses a minimally invasive, navigation device similar to a global positioning system (GPS) to locate and biopsy spots found in the deepest parts of the lung. This outpatient procedure takes around 60 minutes to complete from start to finish, and patients are typically able to leave the hospital within two hours after surgery. Prior to ENB, the only way to get a biopsy from a spot on the lung was through major surgery accompanied by high patient risk. If the individual was not a good candidate for surgery, waiting and closely monitoring the spot for growth was the patient’s only option. If a biopsy comes back positive, PMC’s Pulmonologists work together with the hospital’s thoracic surgeons and oncologists to care for the patient. 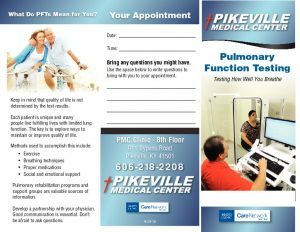 For more information about pulmonary services offered at Pikeville Medical Center, call 606-218-2208. In addition to the innovative, advanced services offered, it is important to note that our physicians have access to some of the most advanced diagnostic equipment to be found anywhere including state-of-the-art CT scanners, the Espree MRI (1.5T) as well as the Verio MRI (3.0T) and digital X-rays. Scans are available to physicians via our PACS system from almost anywhere. Click the brochure above for more information. Note: Please confirm the location of your test with our staff as locations can vary!